This tool will help you approximate the monthly payments on your next auto purchase. First input the price of the vehicle, along with your down payment, trade-in allowance, interest rate, and the total number of monthly payments. Click on CALCULATE, and you’ll receive an estimated amount for your monthly payment, as well as the total amount you’ll need to borrow from a lender. If you've never purchased an automobile before, or even if you have, you should know that the process is anything but simple. This purchase entails a major expense, and although many consumers assume that a vehicle is an asset, the truth is that you're paying for a tool, plain and simple, one that transports you from point A to point B. Automobiles don't gain value (unless you get a classic and restore it, but even then you're probably putting a lot of money into the project). So you need to take great care to select a vehicle that suits both your budget and your purposes. Whether you opt for a modern model or you go for a classic beauty, there are things you need to know going into the process. Here are the key points to consider when you're planning to purchase a new or used car. You can absolutely finance through a dealer if you so choose, and many consumers opt to go this route when purchasing a car, be it new or old. But the truth is that you have more bargaining power when you show up with a pre-approved loan in your back pocket. And chances are good that your bank, credit union, or other trusted lending institution are going to give you a better deal than what you'll get from a dealership. Of course, pre-approval also gives you a good idea of your budget going in. So before you even consider signing on the dotted line, talk to lenders about getting pre-approved for a car loan. While you might be able to finagle a screaming deal by walking in with a suitcase full of cash, the truth is that no reputable dealer is going to lose money on a sale. No matter how much they drop the price, you'll still put money in their pocket one way or another, cash or no. And walking around with thousands of dollars in currency isn't exactly safe. If you really want to get the best price when purchasing a new or pre-owned vehicle, consider pulling out your AAA card. Many dealerships have agreements in place with the Auto Club that provide you with a price that is a set percentage over dealer cost. There will be no negotiation - the number is firm. So if you don't like to haggle, this is a good bet for getting the best possible price. Many dealerships now offer certified pre-owned automobiles for consumers looking to save some money on a recent model while still retaining the perks of purchasing a newer vehicle, namely the warranty. The automobiles offered through such programs tend to be just one or two years old, and they're often vehicles that are coming off lease. This guarantees low mileage and generally, minimal damage. In short, you'll end up with a practically-new mode of transportation. In addition, the dealership will complete a full inspection and repairs, ensuring you don't end up with a lemon. And you'll enjoy, at the very least, a limited (if not a full) warranty. Best of all, you won't pay anywhere near what you would for the latest model off the assembly line. This is something that can be difficult to determine, especially if this is your first time shopping for an automobile. You can start simply enough by perusing options online or visiting dealer lots. This will allow you to look at sticker prices and compare the costs for various makes, models, options, and upgrades. At some point, though, you're going to have to get down to brass tacks by talking with salespeople and finding out what additional costs are going to be added to the base price of the vehicles you're interested in. The up-front costs could include a lot more than the listed sticker price. And even if you haggle it down, you could still face a slew of extra expenses, including sales tax, finance charges (if you fail to get pre-approved for a loan), add-ons (anything they can talk you into - extended warranty, prepaid service plan, special seal coating, etc. ), and of course, fees. Knowing your costs from the get-go is important for a couple of reasons. For one, it can give you the leverage to negotiate (if one dealer offers better pricing). But you also need to know what you're getting into if you want to make an informed decision. Finally, it behooves you to select a dealer that you feel comfortable working with. If you're not digging the sales pitch, feel free to look elsewhere. The costs of owning and operating a vehicle don't begin and end with the purchase price. Whether you opt for modern or older vehicles, they're going to come with ongoing expenses. With an older vehicle, you'll likely pay less for registration and insurance, just for example, but you could end up paying a lot more for fuel, especially when compared with modern, fuel-efficient options like hybrids, electric cars, and alternative fuel (diesel, biodiesel, CNG, etc.) engines. And then there are repairs and maintenance to consider. The point is that a vehicle that costs you less up-front might not end up saving you in the long run. As a responsible consumer, it is your duty to comparison shop in order to ensure that the product you purchase is right for you and meets all of your needs. This includes practical considerations such as size and budget, but also aesthetic preferences, as a secondary concern. You'll have to weigh the pros and cons of comparable makes and models, poring over spec sheets to ensure that you're getting the best deal. For new cars, check out prices available on sites like CarsDirect and TrueCar. For used cars, check out sites like KBB and NADA Guides to see the book value of the car you are interested in. And don't forget to test drive anything you're interested in. Getting behind the wheel could make a big difference for the vehicle you ultimately decide to acquire. You're the only one who's going to suffer if you fail to understand all of the costs associated with purchasing an automobile. So don't be afraid to ask the salesperson to go over every detail of the contract before you sign. For one thing, you need to do some research on whether or not the add-ons are worth the up-front cost (generally speaking, the answer is no). But you also need to be clear about the fees you're being asked to pay. Believe it or not, many of the extra charges associated with a vehicle purchase are negotiable. And those that aren’t may not be charged by every dealership or in every scenario. For this reason, it's important to scour your contract line by line, asking for clarification if necessary. It is extremely unlikely that an offer will expire when you walk out the door, no matter what the salesperson says. It is their job to make sales, and they'll often say whatever they have to in order to stop you from walking out the door and potentially making your purchase from a competitor. But don't buy into this hype. The worst thing you can do if you're unsure about your purchase is to let your emotions take over when a shiny, new toy is dangled in front of you. This major purchase requires careful consideration, so don't turn into one of those people that goes in to take a look and walks out with a new set of keys. Take your time and you'll get just what you want. Once you take possession of your new or used vehicle, you're pretty much stuck with it. So before you sign anything, insist on inspecting the car yourself. Even if you don't have any mechanical knowledge, you can tell when there's a dent or ding and you can see if the floor mats are missing. You can identify a vehicle warning light on the dash. You can tell when the engine is idling incorrectly or the shifter sticks. These are all things that could significantly impact your interest in a particular vehicle. 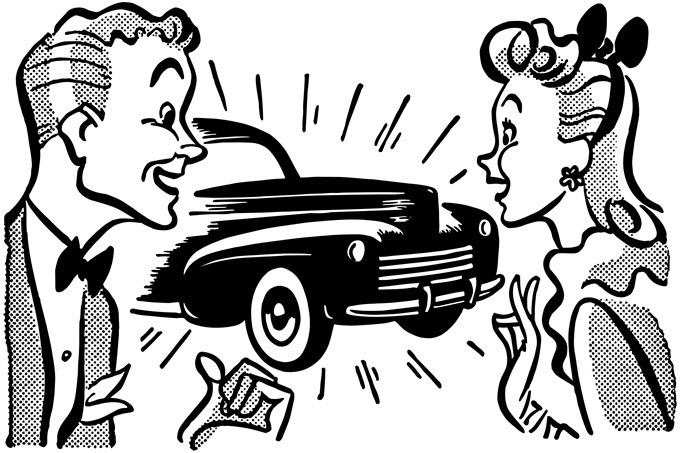 So in addition to a test drive, make sure to thoroughly inspect any vehicle you're interested in purchasing. This is negotiation 101. The minute you're invested, the salespeople have won, and chances are good that you're going to end up paying more than you want or walking away with a lot of extras you neither need nor want. Of course, you have to be realistic - you're not getting an automobile for less than dealer cost. But if you go into a transaction with a reasonable number in mind, there's no reason you shouldn't be able to haggle down to a number you're comfortable with that's still fair to the dealer. And this is doubly true for older cars. But if you want to stick firmly to your price, you have to be willing to walk away and find another deal that's better than the one being offered. Often, a salesperson won't let you get away if you're intent on making a purchase.